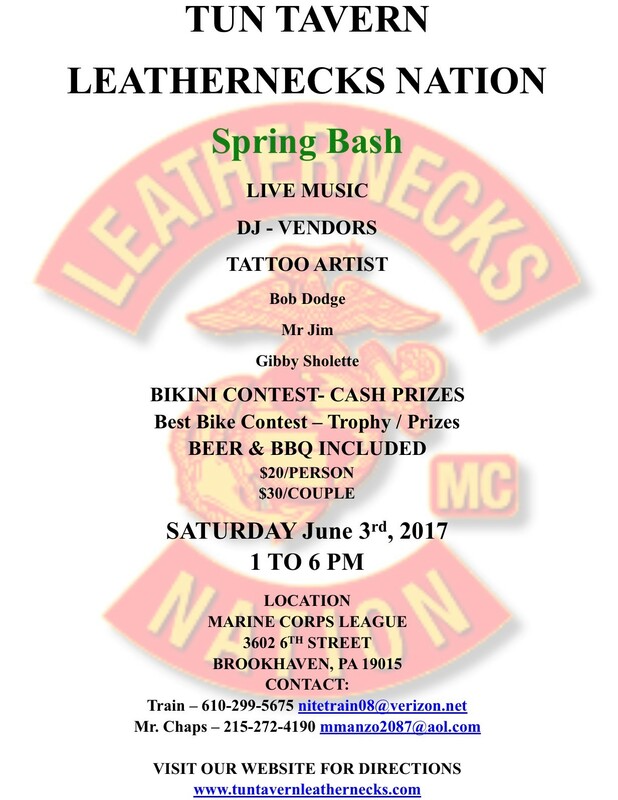 Just as the United States Marine Corps is a proud and distinct organization which stands apart from other military organizations, so too, the “Leathernecks” Tun Tavern Chapter Motorcycle Club is a proud and distinct organization of active-duty and former Marines and FMF Corpsmen. We stand apart from, yet not against, other motorcycle clubs. 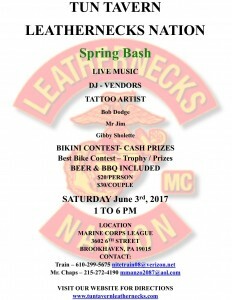 Just as the United States Marine Corps supports God, Country and Marine Corps Brotherhood, so too, the Leathernecks Nation Motorcycle Club supports God, Country and Marine Corps Brotherhood. 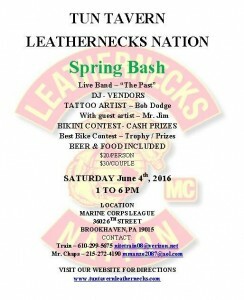 The “Leathernecks” Tun Tavern Chapter Motorcycle Club is not territorial and claims no territory. We have no need of reputation building. We are not a 1% Club. We are not interested in joining, or interfering with, the affairs of others. We desire only to ride our motorcycles in the company of our brothers. We will never seek to violate anyone’s rights and we expect the same courtesy in return. Contact the Philadelphia Tun Tavern Officers. 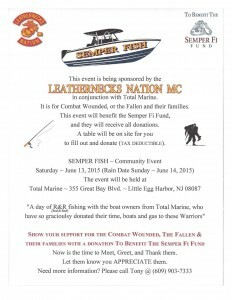 Little Egg Harbor, NJ – Leathernecks Nation Motorcycle Club in conjunction with the local marina, Total Marin, have organized a day of rod and reel fishing on Saturday, June 13, 2015 (Rain date Sunday, June 14, 2015) with some of the boat owner at Total Marine. These boat owners have graciously donated their time, boats, and gas in order to take over 30 Service Members and their families fishing for the day. If the Service Member requires modified fishing equipment, they will provide that as well. All free of charge! After a day of fishing, the Service Members and their families will return to a BBQ picnic with entertainment. This event would not be possible without the support of the Little Egg Harbor and Tuckerton communities. Donations will be accepted at this event to support the Semper Fi Fund. Service Members interested in participating should contact Anthony Bowen. Tickets available at event, or advanced purchase. Contact Train, or Mr. Chaps for details. 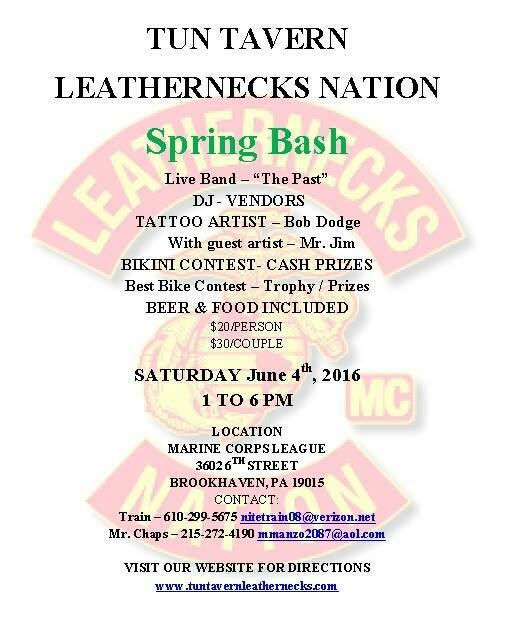 Come out and support your local Leathernecks!